“An ounce of prevention is worth a pound of cure.” As this old saying goes, safety should be an important element in every industry. Safety covers hazard identification, risk assessment and accident prevention. Safety should always come first and remain so despite of costs. Good design and forethought can often bring increased safety at less cost. Operators of volatile plants must implement measures to ensure that their plants are operated and maintained in a safe manner. In the chemical process industry there are chances of a number of potential hazards. A hazard has the potential of causing an injury or damage to the plant as well as the working members. Raw material and intermediate toxicity and reactivity, energy release from chemical reactions, hightemperatures, high pressures, quantity of material used etc. are some of the hazards that can cause damage in a chemical industry plant. HAZOP refers to Hazard and Operability studies. HAZOP is a systematic technique for examining potential hazards in the system. With HAZOP, the process is broken down into steps where every parameter is considered to see what could go wrong and where. This is the most common hazard analysis method for complex systems. It can be used to identify problems even during the early stages of project development, as well as identifying potential hazards in existing systems. A multidisciplinary team is formed under the guidance of a leader. The team includes a variety of expertise such as operations, maintenance, instrumentation, engineering/process design, and other specialists as needed. The fundamental requirement is an understanding of the system and willingness to consider various parameters at each step of the process. The team must create a strategic plan for the entire process identifying individual steps and elements. This typically involves using a plant model as a guide for examining every section and component of the process. For each element, the team will identify the planned operating parameters of the system at that point: flow rate, pressure, temperature, vibration, and so on. The team must be open to the idea of considering every possible variation to the parameters identified. Every deviation should be studied and potential hazards to be identified for each scenario. Once the team has identified potential hazards, they must estimate the impact of that failure. Existing systems should be evaluated and their ability to handle deviations in the future must be taken into consideration. To identify all deviations from the way the design intended to work, their causes and all the hazards and operability problems associated with these deviations. To decide whether action is required to control the hazard or the operability problem, and if so, to identify the ways in which the problems can be solved. To identify cases where a decision cannot be taken immediately and to decide on what information or action is required. To ensure actions decided are followed through. HAZOP studies can be implemented for new facilities or existing facilities or processes. 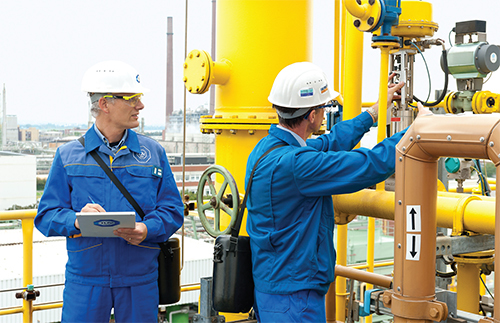 When a HAZOP study is performed in the planning stage of a new process, completing the study means that all potential causes of failure will be identified.Whereas in existing facilities,instead of one assessment, the results will be released as each problem is identified and solutions are created.